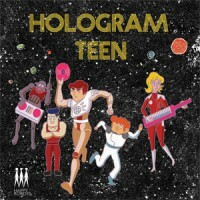 Hologram Teen is releasing a 2-track single on 7" vinyl via London's Happy Robots Records. This is the solo electronic motorik disco project of Morgane Lhote, former long-term keyboard player of Stereolab. Originally from Paris, Morgane moved to London when she was 20 and spent 12 years there. Then she moved to NYC and, nine years later, moved to Los Angeles. Her name is known to many for her work as keyboard player in the seminal indie kosmische act Stereolab, having recorded and performed with the band during their imperial phase between 1995 and 2001, when they released a series of career defining albums including ‘Emperor Tomato Ketchup’ and ‘Dots and Loops’. Fans of Common will also be able to find Morgane on the Sgt Pepper inspired sleeve for his Electric Circus album. She followed her time in Stereolab with a stint in The Projects and, from 2005, played in Garden with members of Simian Mobile Disco before starting the Hologram Teen project.